I can’t actually believe that I haven’t recommended this product earlier; I have been using this religiously for well over a year, pretty much every time I use a face mask! I bought this product because I always felt as though my eye area got left out when I was doing face treatments in the bath. It’s all very well putting bits of cucumber on your eyes, or soggy lumps of cotton wool, but sometimes (read all the time) we want something that’s luxurious, convenient, and above all, actually works. Cue Elemis Absolute Eye Mask, a light cream mask that helps to soothe and revitalise tired eyes. The Elemis Lady in Harvey Nics promised me that this would help reduce my dark circles; I have no idea whether or not it has, there’s not a remotely sensible way to test this other than only ever applying it to one eye. What I do know is that my eye region now gets treated the same as my face, and the area always looks far more rejuvenated and fresh than before. A little of this goes a very long way; so much so that I have probably only used about half of the 30ml tube in just over a year. So, not bad value for money, and far less messy than having to scrape up pieces of scummy cucumber from the side of the bath. I use this the night before I have a modeling shoot, to soften fine lines and to rest the skin before it undergoes the cosmetic equivalent of chemical warfare. 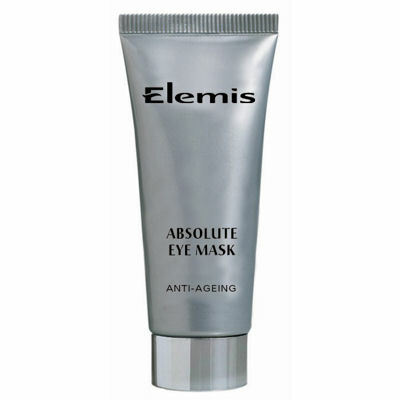 Absolute Eye Mask, £27 from Elemis.